The Otter trail is probably one of the most famous hikes in Africa and definitely one of the best treks in the world. We know what we’re talking about we’ve hiked a lot in Asia, South America, Europe and Africa. The scenery on the Otter trail is spectacular, every day it surprises you with breathtaking views, white-sand beaches, dramatic cliffs and an endless coast line. Not to mention overnight huts in the most beautiful locations. The hike’s difficulty is easy to moderate, daily distances covered are quite short, total distance 45km over 5 days, which gives you a lot of time to admire the nature and enjoy the beauty of the area. If you’re looking for a relatively easy and incredible beautiful hiking trail in South Africa, Otter trail is the best option. Our Otter trail hiking team. We had an awesome time and a lot of fun! You can book a trail no longer than one year beforehand, spots for December and Easter holiday are the first to be booked so if you want to hike in these periods rather book in advance. We got our 2 spots by chance just two days beforehand due to a cancellation. The other 8 people from our group got cancellations as well and booked the hike less than a month beforehand. It’s easy to get a spot if you’re 2 to 4 people and you’re flexible with dates. For bigger groups it’s advisable to book as early as possible. Check for Otter trail availability and cancellations HERE or over the phone (012)428-9111. Maximum group size 12 people. If you’re consistent and check availability almost every day you might be lucky. 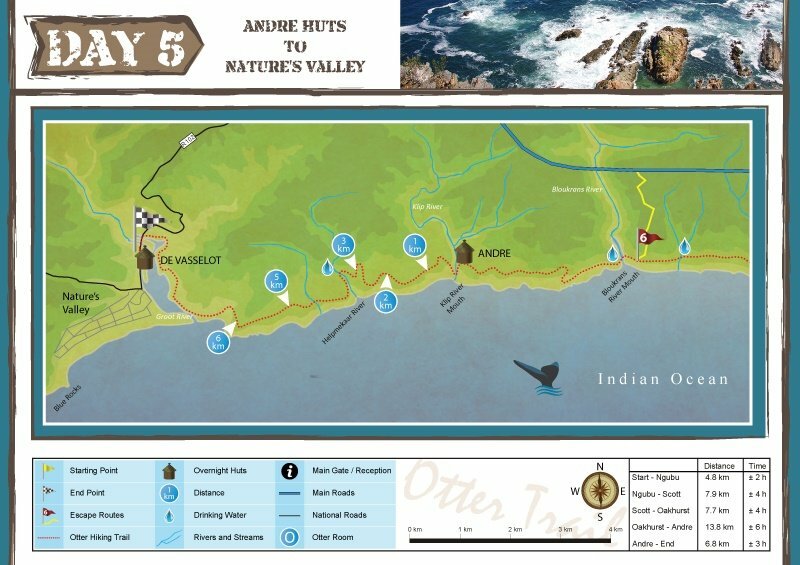 Otter trail hiking map. You get a map like this at the office with a hiking book. Very handy and useful. Daily conservation fee – ZAR54 pp for South Africans, ZAR108 for SADC citizens, ZAR216 for foreigners. Wild Card Holders don’t pay the fee. Trail cost in 2018 – ZAR1232/per person includes staying in 4 overnights huts serviced every day, trail book with a maps and tides table. Shuttle service (optional) – ZAR200 pp if two, negotiable if more people. You can do it all year around there are some advantages and disadvantages of hiking in different seasons, weather in Storms River area changes very quick. Rain. In this area you can get rains any time, the most rainfall is in August, October, November and April, average 10 rainy days a months, with 50mm precipitation per month. In other months you get between 7-5 rainy days, with 30mm precipitation. Any month you hike it’s quite likely that you get at least one rainy day. Temperature. The hottest months are December – March, average day temperature +25C, av.night temperature +16C. The coldest months are June – September; +19C during the day and +8C at night time, it can get down to +4C or so some nights. Otter trail is probably on of the most beautiful hikes in the world. You have two options; to leave your car at the starting point, Storms River Mouth National park or at the finish, Nature’s Valley National park. In any case you’ll need a shuttle to get either to the trail or back to your car. Both parking spots are inside the National parks it’s quite safe to leave your car there. If you’re a group of people and drive in two cars you can leave one car at each side. As for the shuttle service we contacted Burtin 073-800-6811, we got his phone number in the park office, his car can fit 6 people. We took it back from Nature’s Valley to the Storms River and paid ZAR600 for six of us, plus the toll ZAR50 per car. We did bargain down the price as originally it was ZAR750. If you’re only two he charges ZAR200 per person. You can do it other way around and park at Nature’s Valley and take the shuttle to the starting point. If you don’t have a car it’s possible to arrange a shuttle from Port Elizabeth or any other nearby town inquire in your hotel. Beautiful sunset on the second day of Otter trail at Scott hut. You can download and print our complete packing checklist for the hike including both must-have and optional items. Pack food for 4 breakfasts, 4 dinners and 4 lunches (5 if you’re planning to have lunch on the last day). Our food packing list; instant flavored oats and coffee/tea for breakfast, biltong/droewors and nut mix/energy bar for lunch and pasta/smash, tomato sauce and tuna (can) for dinner. Take chocolate, cookies or nuts for snacking. Tap water at the huts is potable no need to take purifying tablets or UV filters. 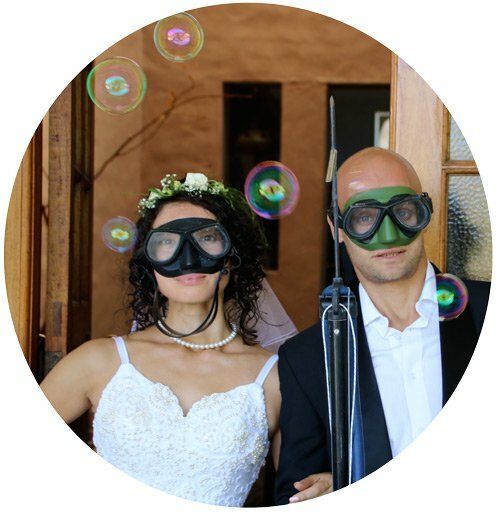 Don’t drink water from Kleinbos, Elandsbos and Lottering rivers as they warn at the reception. Water from Bloukrans river is not potable either it’s too salty. There are several falls and creeks on the way to refill you water bottles. We refilled every morning both our 1,5l bottles at the huts and it was enough for the hiking day. To add some flavor bring flavored instant drink mixes. You register at the office where they explain you some details about the hike, river crossing, give you a small book about the trail, it has a lot of info; distances, diagrams, estimated walking time, river crossing tips, information about local flora and fauna, park rules as well as a trail map – very helpful, small and easy to use book. The trail starts at Storms River Mouth National park and ends at De Vasselot Rest Camp (Nature’s Valley). Total elevation gained (over 5 days) – 2600m. The trail is well-marked and easy to follow, no GPS needed. 4 river crossing; Kleinbos River – day 2; Elandsbos and Lottering River – day 3; Bloukrans River – day 4. 4 overnight stops with two 6-bed huts each. Difficulty level 6 out of 10; distances are quite short but there are many ups and downs not very long but quite steep. Moderate level of fitness required. Don’t pack too much otherwise your back will suffer at every single uphill. Our backpacks were quite light, 8kg and 10kg. At the office we were warned about monkeys and baboons trying to steel food but in fact genets were our biggest problem. If you leave a window or a door opened (close only security gate) these guys can easily sneak through, we had them several times in our hut. Once it ate our dinner leftovers that we kept for breakfast. We saw baboons only once in the last morning a huge male was stealing rubbish bags from a bin. A yellow footprint, Otter trail marking. There are four overnight stops; Ngubu, Scott, Oakhurst and Andre, each stop has two huts with 6 beds (two 3-level bunk beds). The huts are located at the sea level no matter how high you climb you’ll have a down hill at the end of every day. The huts are situated in the most beautiful spots overlooking the sea. Braai place at each hut. Outside cold shower (Ngubu and Andre huts – open-air showers). Roofed kitchen area with braai place, wood, grid, tables and benches. *wook stored outside and gets wet if it rains bring firelighters (blitz) with. Ngubu hut. All the huts on the trail look exactly the same. A standard overnight hut on the Otter Trail. The shortest day on the hike no need to start early, some people drive the same day all the way from Cape Town. You can easily start after midday. The trail starts in the forest and meanders down to the coast. The second part along the coast is more tricky you walk on rocks and boulders be careful they can be slippery when it rains. Once you reach the waterfall take you time there, go for a swim Ngubu huts are not far. At Ngubu huts we saw a bushbuck in the bush, dolphins jumping out of the water, giant snails and genets. Don’t miss sunset it’s beautiful. There are a couple of rock pools at the beach where you can snorkel, we saw a lot of fish and sea stars. Beautiful waterfall on the first day. Nice for a refreshing swimming on a hot summer day. Genets were frequent night visitors to our huts. Note! Water from the Kleinbos River is not potable. Skilderklip quartz outcrops and view point, short detour at 1,9km mark. Blue Bay, detour at 6km mark all the way down to the sea over the rocks to the stunning beach. In the beginning steep up all the way to the top, then walk along the coast with some incredible look outs. Take a detour to the quartz outcrops. Steep down to the Kleinbosh River though it’s narrow it was a bit of a mission to cross it as water was waist-deep (we crossed it close to high tide). Steep up, at 6km detour down to the beautiful Blue Bay after long steep up all the way to the top. On the top don’t miss a wooden deck look-out it gives you incredible views. After all the way down to the sea to Scott hut. Campbell swimming in a rock pool at Blue Bay. Picturesque Blue Bay beach from the view-point. You climb here all the way from down there. Note! Water from the Elandsbos and Lottering rivers is not potable. The Elandsbos River, wide sandy beach. The Lottering River, nice for swimming, beautiful beach. Normal day on the Otter trail, with some ups and downs. Two river crossings; Elandsbos river, the river is quite wide we crossed it 1 hour after the high tide in kneed-deep water, the bottom is sandy. After the river a steep up and later down to the Lottering river. To cross it wan’t a problem, we did it 3 hours before low tide water was just over knees, the bottom is mostly sandy, some big rocks close to the shore. Oakhurst hut is just 5 – 10min. walk from the river. Scenery on the third day, the trail continues meandering along the coast. View over the Lottering River on the way to Oakhurst hut. Several waterfalls (if it rained a bit). 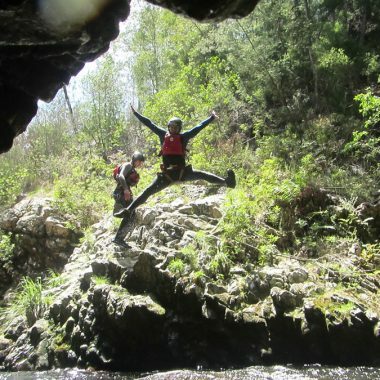 The longest day with the main challenge on the trail – Bloukrans River crossing! The trail starts from the steep uphill and continues meandering between the coast line and the jungle with a couple of waterfalls and small creeks on the way. For this day it’s important to cross the river at low tide. The distance from the hut to the river is about 10km, it took us 3 hours to get there. We had lunch at the river while waiting for low tide and crossed it 3 hours after the high tide, it was waist-deep. From Bloukrans River it’s about an hour walk to Andre hut. Bloukrans river at high tide. Breathtaking view from the trail on the way to Andre hut. The best way to do it is to cross right at low tide, you just walk in knee deep water but if you’re unlucky and low tide is too early or too late try to cross the Bloukrans as close to it as possible. At the office you get a tide timetable, if you want to know beforehand check for tides HERE. Attention! If the Bloukrans River is too full after heavy rains and the crossing is dangerous don’t risk rather use E6 escape route, 500m before the river. Through the forest to the plantations till you hit a gravel road where you have cell phone reception, phone rangers and they will assist you. Emergency number 072-917-4474. Waves, at high tide they are quite big. Current when the tide goes down, it gets strong make sure it doesn’t drag you out into the sea. Rocky bottom, ensure every step you make to prevent slipping. Leaking survival bags, all survival bags (different brands) in our group leaked some more some less, make sure all your valuable stuff (camera, wallet, phone etc.) is secured in additional plastic bag or better in a dry bag. Bloukrans river crossing two hours after the high tide. Water is waist to shoulder-deep but when a wave comes you’ll have to swim. Stunning view from the look-out on Andre Hut. The last day no more river crossing, only the Klip River a small and shallow river next to the hut. Steep up hill in the beginning to the top with breathtaking view over the area. Long walk on the plateau along the coast with light ups and downs till you reach the beach. The view from over the beach and Nature’s Valley from the top is incredible! You walk a section on the beach and then the trail turns right into the forest and continues for about 3,5km till you reach De Vasselot Rest camp. The trail used to end on the beach at Nature’s Valley but it was extended. We were told the reason for this is that it’s not safe to cross the Groot River. We walked a new route though the river crossing didn’t look any dangerous, some of our group members crossed it. When walking the beach section again next day we found the river was ankle deep. All our group members finished the hike by 11am. At De Vasselot office you sign out and get an Otter trail certificate. According to the tradition after the trail hikers go to restaurant to celebrate. It’s about 3km from De Vasselot in Nature’s Valley town. There is a tree in the garden where hikers hang their old shoes, bags, caps etc. Here you can get one more certificate that you completed the Otter trail (free) and get special shooters (not free). View over the sea from the plateau. View over the Nature’s Valley beach. Where to stay before and after the hike? If you like camping we’d highly recommend to camp either at Storms River Mouth campsite or at De Vasselot Rest camp in Nature’s Valley. Both places have great facilities and located in beautiful spots. Storms River campsite is right at the sea with a stunning view that offers great chances to spot dolphins and even whales. Dassies running around all over the campsite and occasionally otters or bushbacks may be in the proximity. There are a couple of day hikes nearby as well as a snorkeling trail. Price ZAR370 per site (max 6 people), plus daily conservation fee ZAR54 pp. There is ablution complex, kitchen with electric plates, washing machines, braai places, running water. There are chalets and cottages for rent from ZAR1200. De Vasselot Rest camp is 15min. walk or 5min. drive from the beach, at the river bank. Grassy spots, good ablution complex, kitchen, braai place, table and benches at each site. There are several short hiking trails around, kayak rental is available at the reception ZAR80 per hour. The place is beautiful but monkeys are very annoying, we couldn’t eat anything here as soon as you start unpacking food these guys are all around you trying to steal it right from your hands. Price for camping ZAR205 per site (max 6 people), plus daily conservation fee. Forest huts ZAR545. There are many accommodation options in nearby towns; the Crags and Stormsrivier. We went to check out Rocky Road backpackers 15km from Nature’s Valley and absolutely loved it! Big and beautiful place, stunning garden, great staff, different accommodation options; double rooms, luxury tents or camping. If you want to relax in a nice place after the hike check African Crags Eco lodge; comfortable rooms with stunning views over the sea or the mountains, good breakfast, extra large soft beds, helpful staff all you need to chill after a 5-day hike. There are plenty of accommodation options in Stormsrivier village as well, from budget backpackers to luxury lodges. Stormsrivier is a nice little town with a couple of restaurants and coffee shops, famous Tsitsikamma canopy tours and short hiking trails nearby. Hello, Lezette! Thank you for the comment! Enjoy the Otter Trail! Hello! I noted in the article you said trail transfer was R200 pp, was that from the finish to nature’s valley or back to the beginning of the trail? Which company did you use? Hello, Callie! Please, check the fifth paragraph of the post Shuttle service and parking on the Otter Trail, there are all the details about the transfer including name, phone number, price etc.